Strange Answers: "How do you make the most realistic cobwebs?" | Dapper Cadaver Blog » Gothic, Horror & Halloween! There are essentially two schools to making great cobwebs. Cobwebbing guns and stretch webbing. There’s a third technique I’ve devised I call Pro 90 Webbing, which I kept secret for years. Now that I’m working in the shop more than on set, I’m not doing cobwebs so much, and I’ll share my secrets in this article. I find a lot of people when the want to go pro with awesome spider webs get the cob webbing gun without really knowing a lot about them. Cob webbing guns are great, but they’re no magic wand. I rarely use them because I find them to be a hassle to use, except for under certain circumstances. First, a cob webbing gun is basically a hot glue gun attached to an air compressor, so be aware that anything you spray down with these guns you’re spraying with hot glue, and there’s a good chance you will not be able to clean it off. The air compressor itself is noisy, expensive, heavy, and needs time to build up pressure. The final issue I have with cob webbing guns is the cheap ones and the homemade ones have a tendency to clog alot, and with most hot glue guns, it’s almost inevitable you will burn yourself if you do it enough. For these reasons I find the cobwebbing guns are best used on pro jobs like sets and haunted houses, things where you’ve got a lot of ground to cover, you never plan on cleaning it up, you’ve got some assistance, and you’ve got the cash to invest in a top quality gun and an air compressor. For doing home haunts, cobwebbing props, or cobwebbing areas you have to clean later, they don’t make the most since. Stretch cotton webbing has a bad rap, but it’s actually pretty good if you’re patient with it. It’s also pretty much the only kind of cobwebbing that cleans up okay and doesn’t stain or stick to things. 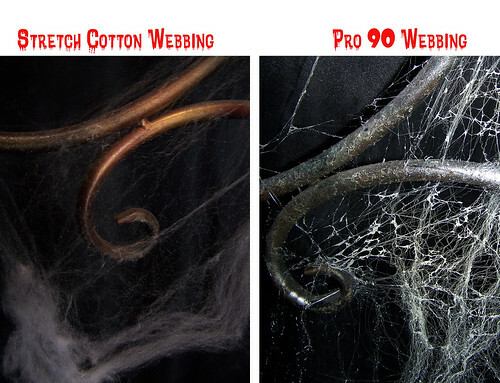 For really excellent, realistic webs, try the Pro 90 technique. 1. Start with ordinary stretch webbing, pull it tight and thin, but don’t worry about over working it at first. 2.Once the stretch webbing looks okay (not great), spray it with 3M 90 spray. This aerosol adhesive forms tiny strands that create cross webs. The glue also reinforces the cotton, so the strands are more visible. WARNING- this is glue, so it is difficult to clean up. Also keep away from open flames. 3. Now that the spider web is sprayed with glue you can sculpt the web even more. While it’s tacky, you can stretch out clumps of web, stick it to other parts of your set or prop, create holes in the web and more. 4. If you need the web to be more visible, try misting it with spray paint or dry brushing it once the glue has dried. 5. Use scissors to trim any excess. 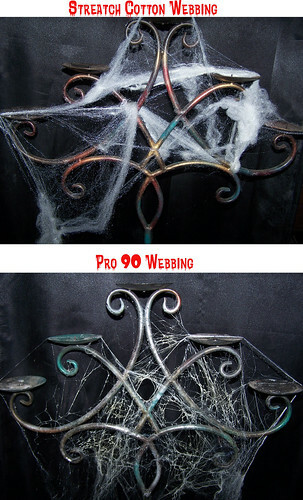 The photos in this post show the same candelabra decorated with both stretch webbing and stretch webbing that’s been given the Pro 90 treatment. 3M 90 is available at most hardware stores and currently costs $9 – $15 per can. This entry was posted in Halloween How-Tos. Bookmark the permalink.